An advisory council is a voluntary group of individuals who meet on a regular basis to support the effective functioning of their local park. Councils promote ways for the community to better utilize the Chicago Park District's programs and facilities; provide communication to the Chicago Park District on matters relating to their parks; increase community awareness of Chicago Park District projects; provide the community with a vehicle through which park information can be shared; and assist in locating alternate funding sources to enhance park facilities. In an effort to do these things,many councils host events and other related activities throughout the year.The Chicago Park District encourages interested park patrons to participate in or form an advisory council in their local park. The Chicago Park District seeks advisement from councils regarding services provided to parks, needs, problems, accomplishments, and any other matters councils consider important to the operation of their parks. Park Advisory Council Annual Report Now Due! All existing and newly formed advisory councils and those interested in becoming an advisory council, must review and complete the forms below. Fax the completed Application, Registration Form, Partnership Pledge and By-Laws to the Chicago Park District Community Relations Division at (312) 742-2797. What makes a PAC compliant? Registered Chicago Park District PACs, enjoy the use of rooms, space for their monthly meeting, application fee waivers, expedited event permit processing, partnership benefits of no or reduced fees and liability insurance. If a PAC is not compliant they will not be privy to these benefits. PACs will be treated like every other community group and organization until they become compliant. View a list of parks with advisory councils, and get meeting dates and contact information. View a list of Advisory Council Frequently Asked Questions. 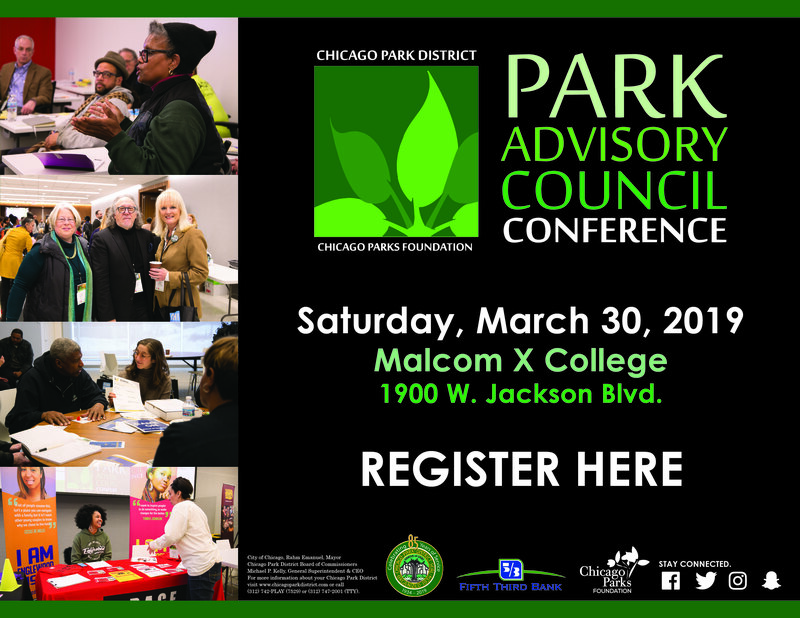 If you have any further questions about Chicago Park District advisory councils, please call the Department of Legislative and Community Affairs at (312) 742-2797. The Chicago Park District has partnered with the University of Illinois Chicago, Illinois Prevention Resource Center of a series of PAC trainings to help PACs with formation, fundraising and special events.